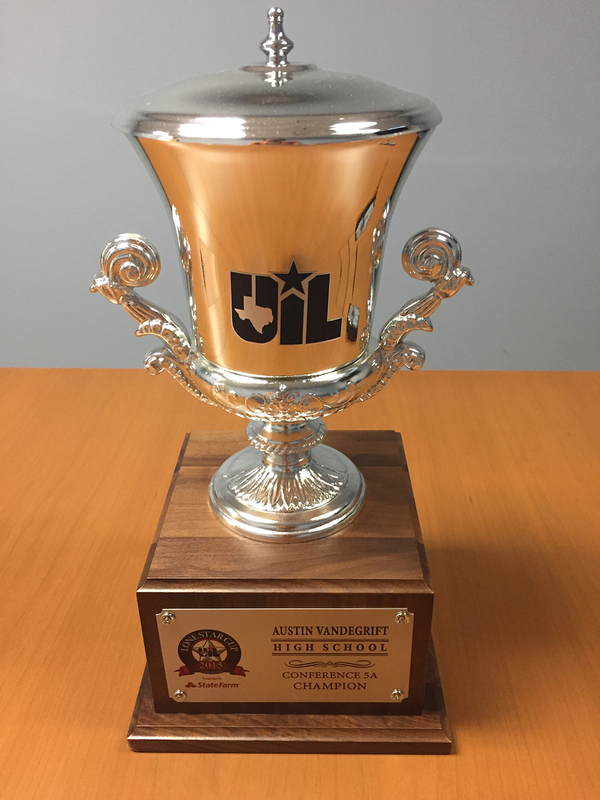 AUSTIN, TX— The University Interscholastic League will honor Austin Vandegrift High School on Wednesday, Oct. 21 for winning the 2015 UIL Lone Star Cup presented by State Farm. The UIL Lone Star Cup trophy presentation will take place during the homecoming pep rally at Ed W. Monroe Memorial Stadium, which begins at 7 p.m.
Austin Vandegrift High School set a school record with 94 UIL Lone Star Cup points after earning state championships in marching band, boys golf and girls swimming and diving. The Vipers were also state finalists in girls soccer, state semifinalists in football, placed in top five at state in girls golf and boys swimming and earned additional points in team tennis, boys basketball, boys soccer and academics. The Conference 5A victory is Austin Vandegrift’s first ever UIL Lone Star Cup win. UIL Assistant Athletic Director Traci Neely will be on hand to make the presentation. Presentations for 2015 UIL Lone Star Cup winners Cross Plains, Shiner, Brock, Argyle and Southlake Carroll occurred earlier this fall.